Personal cooling products are the best way to tackle heat stress and cool down this summer, Easter and Mother's Day Gifts. Do you get overheated, suffer heat stress, headaches, hot flushes, heat related irritability or find it hard to get to sleep on a hot summer's night and looking for a fast effective way to cool down? You need Personal Cooling Products. Hot weather can be tiring, and expensive, for the whole family. With the soaring cost of electricity, families are looking for ways to stay cool in summer without spending a fortune on the cost of power to run air conditioners. We all know it is more important, and more difficult, to cool down than to warm up. Warming up can be achieved by adding a jumper or coat. Finding relief from heat related disorders and cooling down, simply, in a cost effective environmentally-friendly way can be a challenge. Our personal cooling products are the best way to tackle heat stress and cool down this summer! We have the best personal cooling systems. We have more than one body cooling system. Whatever your heat situation is we can provide you with effective body cooling products. From a range of neck tie cooling collars to a range of unique Australian designed Cool Hats with magic Cool Pads, Chill Sleeves, Cool Cloths, Chilly Pashmina Cooling Towel Wraps... we offer innovative and inexpensive ways to keep cool and comfortable on hot days. Our heat sensitivity products have stood the test of time. We have been proudly supplying thousands of people around Australia and the world with our personal cooling products since 2001. We are the experts at keeping you cool when working, playing, or simply relaxing. Save money on your energy bills this summer. 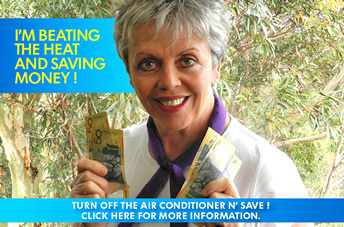 Save thousands on your electricity bills. Invest less than $80 and purchase several neck coolers. Turn off your air conditioner. You won't be turning your fridge off, so store them in your fridge, and simply wear and swap them over. Your neck tie coolers will last for many years and save you thousands on your energy bills. By purchasing our personal cooling products, you will also be supporting cancer research ! Australian-made Cooling Neck Bands for adults and children. Neck Tie Coolers are personal body cooling collars designed to help minimise the impact of heat stress on your body at times of high temperatures to help you tolerate those high temperatures during work or play. These water activated personal evaporative cooling products are great for anyone working or exercising outside! The cool tubes of inflated water crystals in our neck cooling bands cool you down after a hot workout, bike ride, mowing the lawn, riding your horse, gardening , golfing or a hot-flush due to MS, pregnancy or menopause. Tie these cool ties around your forehead, neck, ankles or wrist and stay cool without air conditioning. Our body cooling neck wrap lowers the body temperature by cooling the carotid arteries in the neck. These environmentally friendly ice ties are carbon free, re-usable for many years and come in many colours, patterns and styles. The ultimate in personal climate control products provide a perfect solution to help beat the heat on a hot day. Our high quality cooling neck wraps are 100% Australian owned and made. With each purchase of a neck cooling band, or a personal cooling system, when you purchase an airflow cooling hat also, Personal Cooling Products donates to Cancer Research. Personal Cooling Products make mini neck cooling bands for children. TheseKidzKoolers are the favourite neck cooling things of children world wide ! Always sourcing the very latest and the very best for our clients. Personal Cooling Products never stops looking for the very latest and the very best personal cooling technology. We strive to offer a complete range of unique quality personal body cooling products to our loyal clients. We look to create new styles and add new lines that compliment our existing range. Cool Cloths, Chill Sleeves, Multichill, Chilly Pashmina Cooling Towel Wrap and Exotherm Cool Vest cooling technology are evidence of this commitment. We are proud to be importing from America the very latest in cooling technology. Unique Australian Designed airflo Cool Hats for cool comfort this summer. Cool Hats, designed in Australia, are the perfect cooling headwear for keeping cool in the summer heat. The cooled blood that is flowing into your brain through the wearing of a neck cooler band, is not heated up again because you are wearing a lined hat. When the outside air flows through the breathable micromesh crown of the Cool Hat and the expanded crystals in the Cool Pad, it acts like an evaporative cooler and reduces your temperature. It is this unique “personal cooling system” that allows people to be both cool and SunSmart. Wearing the wrong hat can be a health risk, so ensure your choice of hat is not based purely on fashion. Cool Hats with a magic Cool Pad tick all the boxes for the perfect summer hat to cool you down, make you look good and feel good too. There is a Cool Hat with magic Cool Pad to suit everyone, even outside workers who need a hat to wear whilst using ear muffs. Tradies, yachties, construction workers, mine workers, road maintenance workers, golfers, council corkers, truck or courier drivers, garden nursery employees, fishermen, farmers, horse riders, teachers and students will all love the shading, cooling and protecting they experience wearing a Cool Hat with magic Cooling Pad. Fishermen, and water enthusiasts, particularly love Personal Cooling Products ! The SunGuard is the latest product to protect fishermen, kayakers, rowers, sailors... anyone out on the water , wishing to protect themselves against sunburn and windburn. This multifunctional cool tube headwear is the must have accessory for this summer ! To cool down from the summer heat, you need to look no further than Personal Cooling Products, the Australian personal cooling specialists. The ONLY Cool Vest worth investing in. Personal Cooling Products are the sole supplier world-wide of the Endurance Exothermic Cool Vest. Exothermic Cool Vests, supplied exclusively by Personal Cooling Products, use non-toxic, non-carcinogenic blends of crystalline alkanes that provide low chemical reactivity with extremely high stability. Each blended formulation of Exotherm Alkane is encapsulated in a proprietary copolymer film in anatomical configurations that are user friendly. Acting as a heat sink, the comfortable temperature of the Exotherm Alkanes abstract excess body heat. The blood becomes cooler as more and more heat is abstracted from the surface area. As cooler blood pumps through the cardiovascular system, less metabolic energy is required, slowing sweating. As sweating wanes, cellular hyperactivity is reduced and less electrolyte fluids and precious minerals are forfeited resulting in a prolonged endurance factor.